Tell me how tall you are. If you are have not been measured in a few years, my bet is that you are shorter than you think you are and most likely shorter than you were 10 years ago. Due to the aging of bones, joints, muscles and discs, we are getting a little shorter every day. Estimates vary on where you look, but on average people lose ¼ to ½ inch every decade after age 40 or 50, with losses increasing in later years, and women generally losing more than men. Research from the Baltimore Longi­tudinal Study of Aging, for example, found that women lost an average of 2 inches between the ages of 30 and 70 (and just over 3 inches by age 80). Men lost a little more than 1 inch by age 70 (and 2 inches by 80). There is a wide variability: Some people lose an inch or more in a single decade, some shrink only after age 60 or 70, and a few don’t shrink at all. 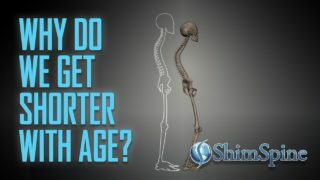 One of the biggest reasons for shrinking as we get older is our spine. The discs, which start out with a high percentage of fluid in them, as they work as a shock absorber in the body, gradually lose that fluid. This dehydration gradually narrows each affected disc space and shorten the spine. 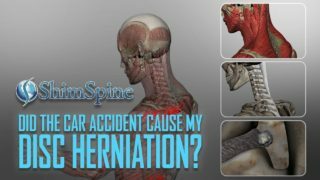 If there is a history of disc herniation, this dehydration can happen at an earlier age and much faster. Osteoporosis is also a culprit. With the loss of bone height and density, the possibility of fractures increases, especially in women. In turn, a fracture will again reduce the height of the vertebral body. Between disc space narrowing and osteoporosis, there is often a loss of the normal curves of the spine. The body, wanting to correct itself, changes its normal posture to bend the knee and hips to keep the head in line with the feet, .and again there is a loss of height. Preventing this completely is almost impossible, but there are things we can do to slow the process down. Look after your back. Get a bone density. Take calcium and vitamin D, and do weight bearing exercises early and throughout your life. Some of us cannot afford to lose an inch, let alone three.